The ODT file is one option found in the suite of documents known as OpenDocument Format for Office Applications (ODF), or OpenDocuments for short. Other file types include a spreadsheet, a presentation document, and a chart. 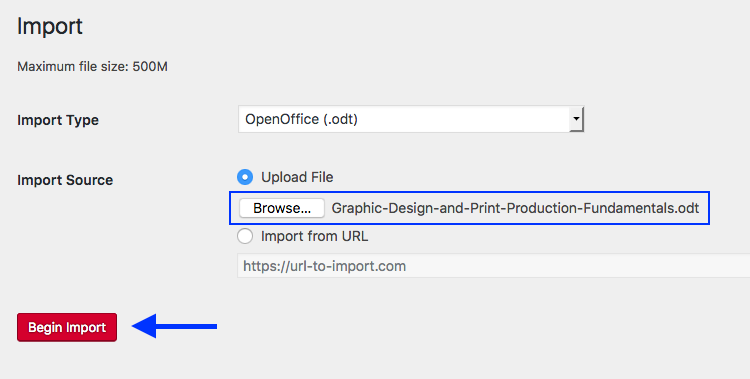 Select “OpenOffice (.odt)” from the Import Type drop-down list. select the Upload File radio button. locate the ODT file to upload using the Browse button. An OpenDocument Text (ODT) file is an open-source word-processing format. It is “compatible with Word and open source applications like OpenOffice and LibreOffice,” though formatting differences exist between the two and certain Word features are not available in ODT files. An ODT file can be opened using Word. However, not all of its elements will work. See differences between the OpenDocument Text (.odt) format and the Word (.docx) format for more information. For help using an ODT file, see the frequently asked questions posted by the OpenDocument online community. Import an OpenDocument Text (ODT) File by Lauri M. Aesoph is licensed under a Creative Commons Attribution 4.0 International License, except where otherwise noted.